It takes two to toast! And we've got the perfect way for friends to celebrate this Hallo-wine season. Just invite over a carving companion and print out one of these stencil patterns for your pumpkin. We think they're gourd-geous! Don't you? 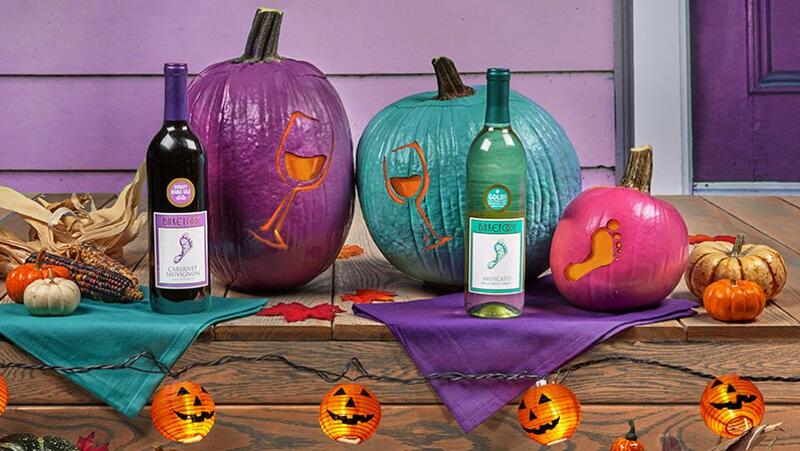 Pop some Barefoot Wine and download your stencil pattern. Cheers!! Cut out the purple areas of stencil, leaving the white space intact. You can either keep the glasses together or cut the sheet in half to use on individual pumpkins. Tape the stencil onto the pumpkin and trace with a pen. Remove the cutout from your pumpkin, and carve along the traced line. Select which foot (large or small) is the correct size for your pumpkin. Then cut out the purple areas of the selected stencil, leaving the white space intact. Remove the cutout and carve along the traced line. It takes two to toast!